When African Slaves were brought to South-America, they were not allowed to play drums. They started to use simple wooden boxes and shipping crates as substitutes. The Cajon was born. The English translation of the spanish word “Caja” is “box”. With time, the Cajon was developed as an instrument, and nowadays many different variations exist. Cajons today is extremely popular to use and easy to bring with you when doing acoustic live gigs with friends etc. The variations of different kind of Cajons are big and there are a couple of DIY construction kits of Cajons available on the market from a couple of different vendors…to low prices. Building these kits is not rocket science either but the hard part is to make them to look nice…painting and finishing etc. 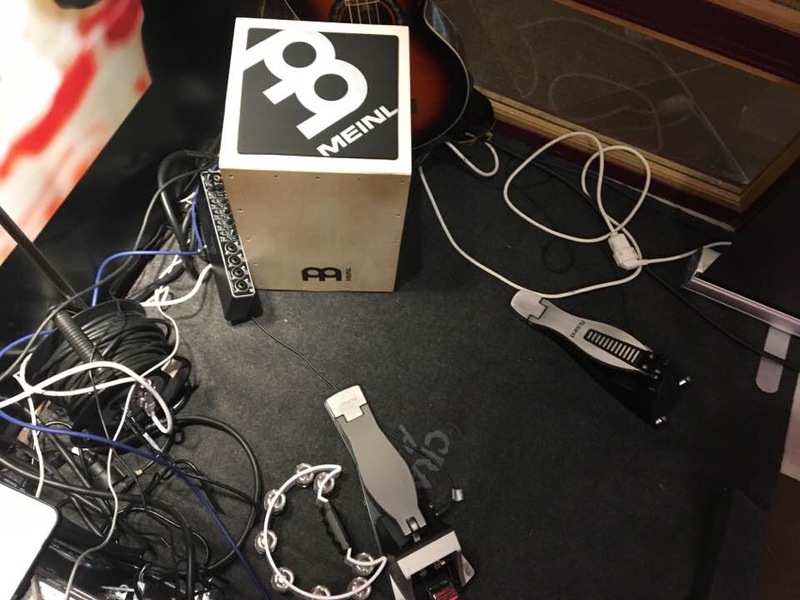 I bought a construction kit from DLX Music in Stockholm manufactured by Meinl Percussion (actually a Roland owned company) and spent some hours building it. No big problem to build and the ASSEMBLY INSTRUCTIONS was real good. Some shaping and sanding was needed to make the Cajon’s surface perfect for adding oil, lacquer, wax, or paint it with an entirely unique design. I did paint my cajon in white color and added a couple layers of lacquer as protection. Playing on the cajon “as is” is actually real fun! My band Powerhell is currently rehearsing for a acoustic live performance…and my new cajon did fit perfect into that setup! However…I am an e-drummer and wanted to add the e-dimension to my new cajon – and do it without destroying the opportunity to use it as an acoustic cajon.. 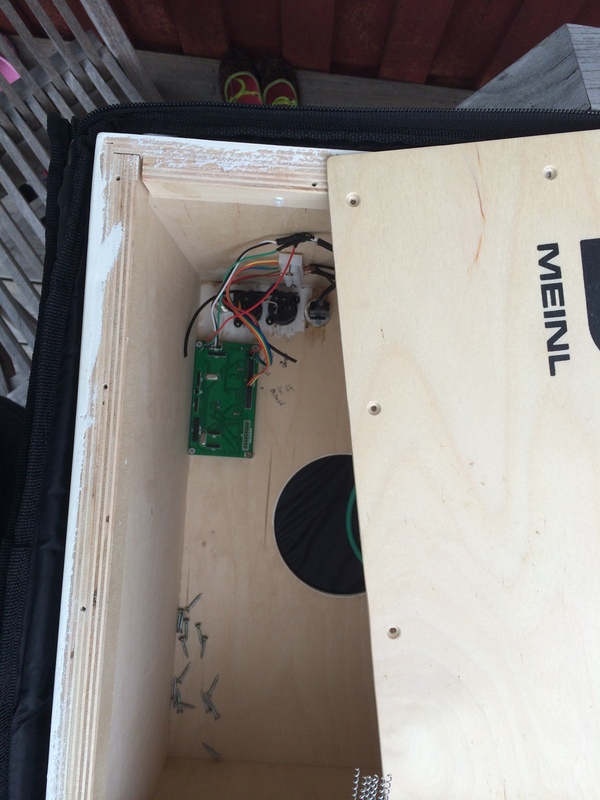 So I did add a couple of piezo sensors mounted in the cajon. Before moving into this project I used internet to see if anybody had been doing such a solution before. I could actually find a couple other solutions where people have been installing microphones in their cajon etc. (There are a couple of cajons sold with a mic built in) During my study I also decided that I was going to install a microphone in my cajon for live purposes and I installed a Shure SM-58 on a special mounted holder. 4 sensors mounted – one sensor mounted on the side. 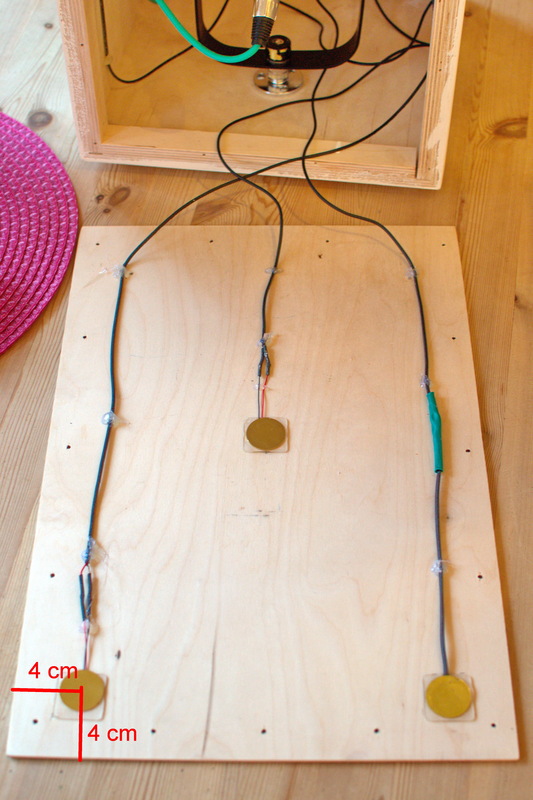 Ok – How and where should the piezo be mounted inside the cajon? From the old post the writer set them in the upper each corner for the snare sound (and hi-hat) and in the middle for the kick. I think I have been extremely lucky to have been finding the sweet trigger spots. In the old post on VDRUMS.COM from 2006 the top sensors are mounted very near each other. I figured out that looking on how others was playing the Cajon, that I was using the top edges instead and the sensors would of course reflect this. But the sensors need to be mounted on the top of the surface…about 4 cm from the edge. I was pretty convinced that this project would end up in crosstalk hell …but I did not, In fact, if I do hit between the hi-hat and the snare sensor(at the top)…the kick drum actually fires. So the 3-4 mm cajon surface of wood seems to have other characteristics than a normal mesh head. 🙂 I had plans to milling down the sensors…1-2 mm in the wood…if the triggering would have been bad from a crosstalk and sensivity standpoint…but it all worked like charm directly. Some soldering of the cables with hot shrinks, some double glue tape from www.stokvistapes.com and their model Superpads (30x30x1 mm), some hot melting glue to fix the cables, some drilling for the connectors etc…Ready! To handle the crosstalk hell between the sensors even more, one common way to do it is connect the sensors the Roland way. The way to do it is like most Roland snare drums are connected is that the head/rim sensors are connected reversed compared to each other. (Doing this will minimize the crosstalk even more). A post about how to do this can be found at the Quartz Percussion site http://www.quartzpercussions.com/#!philosophy/cfvg. Quartz is selling some very nice trigger systems called Quartz on Harness for A to E conversations. When everything was mounted – the midi trigger hart, MegaDRUM was connected. To handle the crosstalk all sensors was placed in the same crosstalk group and the crosstalk suppression functions value was set to 7. Some tweaking of the high/low levels of the sensors was necessary but otherwise – more or less the default values was used. The configuration have now been posted in the MegaDRUM library for the Kick, Snare and the hi hat/crash. As the sound system, I am using both a Windows 8.1 based Microsoft Surface Pro as computer and a Macbook Pro with Addictive DRUMs + ADPaks for creating drum sounds and a M-Audio/Avid Fast Track Ultra 8R as sound card. One of my project goals was to build in a MegaDRUM trigger device module inside the e-cajon. I had an old MegaDRUM ATMega 1280 board laying so I updated it with the last firmware and my e-cajon settings from my previous tests with my external MegaDRUM device. It is a problem to update the firmware without any display or buttons…so I had to installed it in my external device where I have all these kind of features. (An Arm-based MD device is better to use as black box solution / no buttons or display needed) After the firmware was updated – there is no problem to handle the settings/tweaks of the MegaDRUM module over USB through MegaDRUM Manager from a PC or a MAC. The ATMega board differs compared to a Arm-based device on the high/low piezo settings so some adjustments is needed to make it perfect. 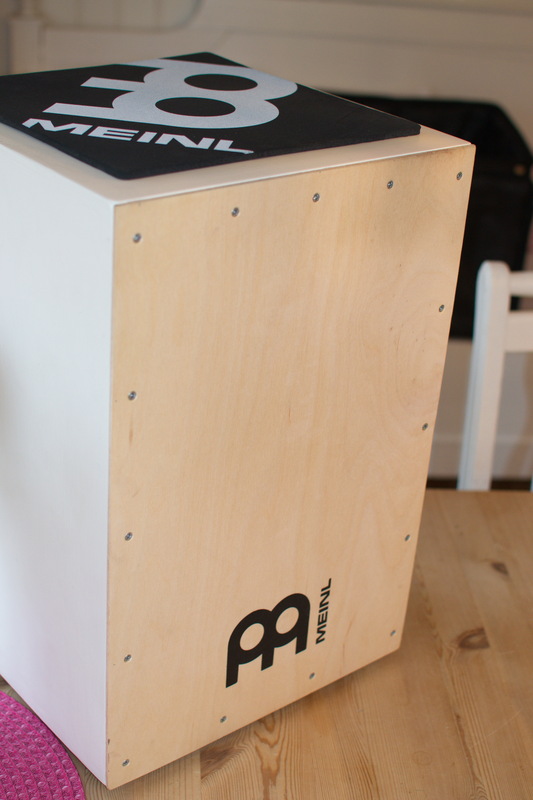 So now it is only to connect the e-cajon through the USB port on the rear to a PC or a tablet with for an example Addictive Drums 2…and play! Very neat! I have also installed a couple of trigger inputs on the rear for a kick pedal and a hi/hat pedal…and which is also working great! I have replaced the ATMega board in my e-cajon to a ARM-based version of the MD. Reasons for this is that the MD can totally controlled from MegaDRUM manager. (So no buttons or display needs to be used) Even functions like auto high level in MD can now be controlled from MDM by setting the high level to 64 and check mark the auto high level checkbox. You will now see how MD starts to measure the high level when hitting the actual sensor in MDM. A perfect black box. Dmitri at MegaDrum just released a lite version of the MD To a Right price….just perfect for an e-cajon! Then there was a lot of tweaking of the MD parameters to get it perfect. I will post these findings soon and a movie how it is working together whit a complete new post when using an iPad as the brain for drum module! 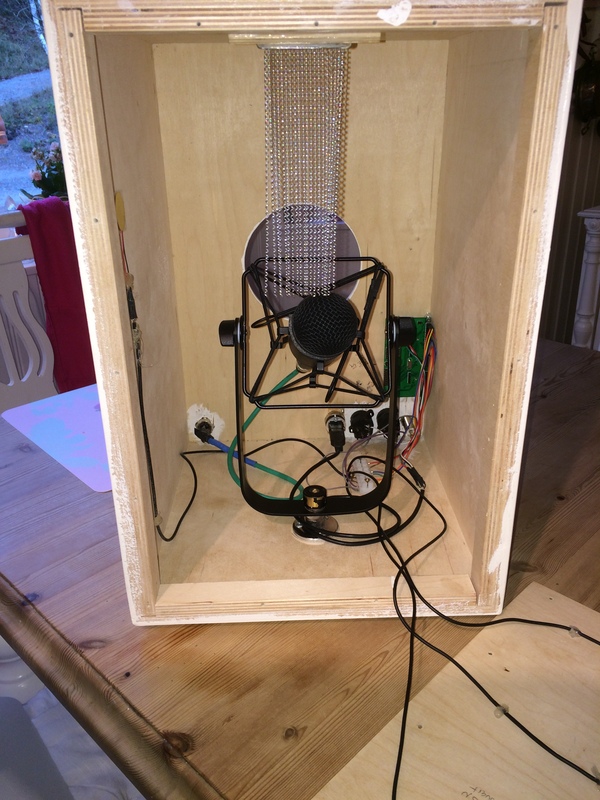 Please visit my second post about the e-cajon where I have installed a MegaDRUM module inside and attach it to an iPad. A special request from digitalDrummer. On request I have also made some e-cajon tests using my old Roland TD-6V module and have been investigating if the same trigger results could work just as well with this device also. Using four separate & different inputs on the TD-6V works very well. (It is not possible to really use the second rim input on the selected channel to combine two e-cajon triggers into one stereo input – MD offers some advantages here…) I have used in the TD-6V basic trigger menu settings, a RT-3T (A single piezo external trigger – the model prior to the RT-10T) and then set the sensitivity quite high (e.g =9-11) and the threshold between 3-5 and crosstalk cancel to 80. I did not change anything in the advanced trigger menu settings. Result – a just perfect e-cajon! Very sensible …you can play it with your fingers…nice wide dynamics and very hard to fire off crosstalk hits. 2016-01-20 – Roland Corp just launched an E-Cajon – called EC-10 EL Cajon…which just proves that a e-cajon is a great idea and invention! Fantastic fun! 2016-12-20 – a week ago my band Powerhell went out and performed an acoustic gig. I was using my e-cajon, this time slightly upgraded with 5 piezo sensors(hmm the EL-cajon has 2) + hihat pedal and a Roland KT-10 kick pedal. Inside the e-cajon I used a internal MegaDRUM module which feeded a MacBook with Addictive Drums over USB. The setup work very well during the performance. Firstly, thank you for sharing your information, I know many people would have tried to sell it! This is really impressive!! Great idea! Your e cajon has made me curious. The cajon player in the band I’m in (www.driftertheband.com), is also a kit drummer, we’ve talked about how a kick drum has more power than the cajon bass. I wonder if I can use your technique to make just a single bass trigger for the cajon, but would I need the whole megadrum kit? Its seems excessive for one trigger. Could I just go straight into a computer or something simple like that? Hi Danny! Nice to hear Thanks!!! A complete MegaDRUM sounds overkill in your case…(I have actually built in a MegaDRUM module in one of my Cajon designs – just one USB conector—and play!). (Had an extra spare module) But $276 for the just the module could even be a bit overkill also for only triggering one piezo. 🙂 The MegaDRUM design is very good to handle crosstalk…but I am guessing you don’t need to consider that with only one trigger. However – I am guessing a Roland TDM-6 or a Alesis Trigger IO would do the task just perfect. Your’s is waaay better than the EC10 I think. Roland kind of dumbed down the UI to such an extent that it’s not as interesting. Thank you so much for your reply. I will keep experimenting and shall share here if I find anything related to what I am looking for. The board comes from megadrum.info. I’d love to copy this system, or purchase a kit or just get a Bill of Materials to purchase. Is there such a thing? Hi! I just added some information on bill of material. Check in the end of this page. I’d also like to attempt building something like this Anders, I don’t have any previous experience with any kind of electronics assembly, can I do all this without much knowledge? I’m very excited by the possibilities of your design! I totally love the idea of building my own E-Cajon. Thanks so far for your article I just came across whilst searching for already existing DIY articles on this. What I don’t understand is, that you are saying there was no “crosstalk” but then saying “doing this will minimize the crosstalk even more”. Anyway, as I don’t plan to use the MegaDrum triggering system I will stick to an Arduino solution. If it works I let you know, as another comment was asking for an Arduino based solution. An e-Cajon with piezos mounted on the same surface…e.g. on the front of the Cajon…will always be generating x-talk…so this need to be handled by the module. I have made some tests with an Ardunio Micro (it has usb midi core support) for some other projects and they work nice as trigger to midi converters. Good luck and please report back your findings! thanks for your feedback! I’m just waiting for my MIDI-breakout board from China. In the meantime I’ll try to mount the suggested Piezos from this article and check how bad the x-talk will be. For my project I’m using a Schlag­werk CP432 2inOne “Deluxe” Makassar with a Roland TM-2. As I’m quite sure to have x-talk as well the Arduino Uno with MIDI shield will eliminate that. Thank god I’m computer scientist and programming is my bread and butter job. I successfully managed to get the E-Cajon working! There was no need to use an Arduino! 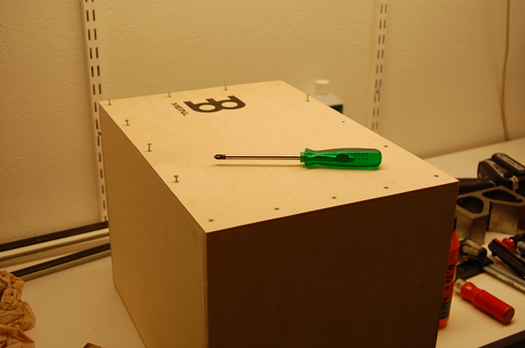 I just placed four Piezo elements inside the Cajon. Three in the front of the Cajon (like you), and a fourth on the rear.